Anand Mahindra who is well-known for his active online avatar is currently conducting quite a unique competition on Twitter. The Chairman of Mahindra Group, who has a fleet of the finest cars, just received the latest Mahindra Alturas G4 premium SUV. Upon receiving the premium car, Mahindra is now looking for a suitable name for his new vehicle. 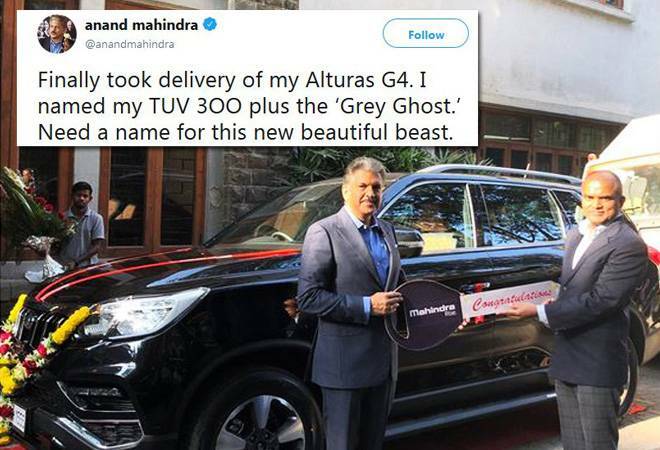 In a tweet Mahindra said that he named his Mahindra TUV 300 Plus ‘Grey Ghost’ and is, similarly, looking for a name for his Alturas. While he said that all ideas are welcome, he later said that he would prefer an Indian name. Mahindra also announced that the one who would lend the winning suggestion would get two Mahindra die cast scale models – but not of the new Alturas, as it is still to be ready. “Finally took delivery of my Alturas G4. I named my TUV 3OO plus the ‘Grey Ghost.’ Need a name for this new beautiful beast. All ideas welcome. The person who suggests the chosen name will get 2 Mahindra die cast scale models (Not the Alturas scale model-that’s not ready yet! )” he tweeted. Naturally, Mahindra’s tweet has set Twitter abuzz with users suggesting some real fine names. Some of the suggestions users have come up with are Indra = India + Mahindra, Jatayu, Ashwa, Devachi, Dark Knight, Black Panther, Dark Legion, Thunder Beast, Bhairava, Airawat, and even Bagheera. But what caught Anand Mahindra’s eye is what Twitter user Vidarbha Veer suggested – Kalbhasma or black ash. Mahindra tweeted that he would indeed want an Indian name. “Yes I would prefer to use a name this time from an Indian language…Keep the ideas coming…” he tweeted. A reworked version of the SsangYong Rexton, Mahindra Alturas G4 was launched last year. The new flagship will take on competition like Ford Endeavour and Toyota Fortuner. The Mahindra Alturas G4 starts at Rs 26.95 lakh and goes on to Rs 29.95 lakh.